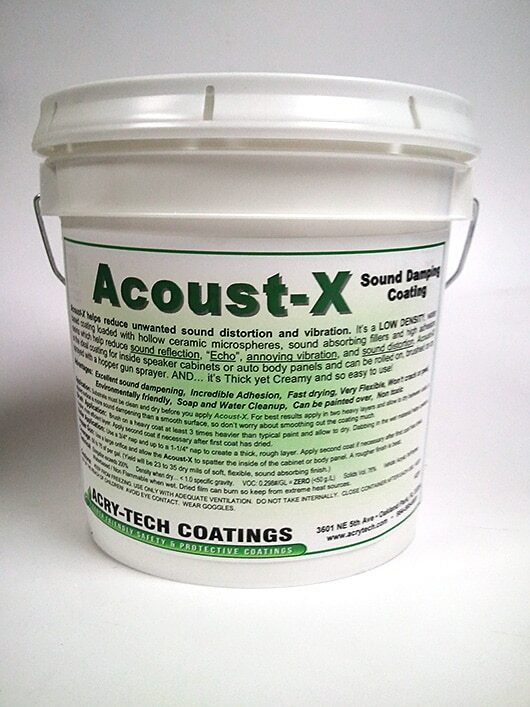 Acoust-X is a low density, high build, soft & flexible sound absorbing coating for speaker cabinet interiors that helps reduce unwanted bounce back, resonance and unwanted vibrations. Apply it within the speaker cabinet prior to assembling the components. Or use it between auto panels to cut down on vibration and distortion. Heavy bodied, yet creamy to apply. Dries quickly and is waterbased. For best results apply in two moderately thick layers and allow to dry between coats. A stippled surface is more sound dampening than a smooth surface, so don’t worry about trying to smooth the coating out too much. Brush Application:Brush on a heavy coat at least 3 times heavier than typical paint and allow to dry. Dabbing in the wet material helps create a rougher, more efficient layer. Apply second coat if necessary after first coat has dried. Roller Application:Use a 3/4″ nap and up to a 1-1/4″ nap to create a thick, rough layer. Apply second coat if necessary after first coat has dried. Hopper Gun:Use a large orifice and allow the Acoust-X to spatter the inside of the cabinet. Do not try to make the coating smooth, it works best with a rougher finish. 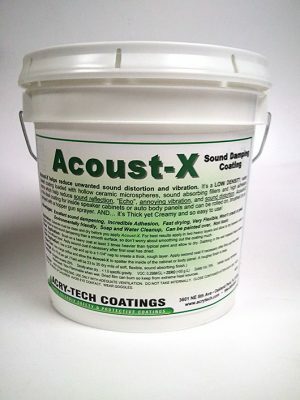 I use Acoust-X inside all my line array designs. I get much flatter response and greater gain before feedback because I have much less acoustic transmission from the back and the sides of the cabinets. this is a really great product and I can’t imagine building a speaker without it!